The TNL-2 is an update of an established assessment of how well children use their knowledge of language components to engage in functional discourse. It measures an important aspect of spoken language and literacy, children's ability to understand and tell stories, a set of skills not usually measured by oral-language tests. 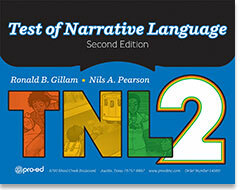 The TNL-2 helps clinicians assess aspects of narrative language without having to transcribe children's stories. It can be used in conjunction with standardized tests that use contrived formats to assess oral language, especially when language-based learning disabilities are suspected. This test is a dynamic assessment in which comprehension and production tasks are alternated, so that children can follow adult narrative modeling. Three types of stories are used: a script, a personal narrative, and a fictional narrative. 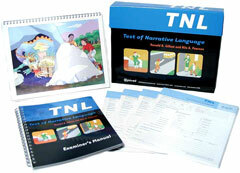 This edition of the TNL has new, more colorful pictures, more inferential comprehension questions, and more items for both the youngest and oldest examinees. Normative data was collected for a nationally representative sample of examinees ages 4 through 15, from 2013 through 2015. The manual contains standardization data, along with evidence of validity and reliability. Administration takes 15-20 minutes. Scoring has been made more consistent for the oral narratives across the three types of stories, making the TNL-2 easier to score and scores more reliable.